Certain plants need a low pH, or acidic soil to grow and thrive. The hydrangea will do well in any pH – acidic or alkaline – but the soil type will effect the flower color. If you don’t care what color your flowers are, then you will accept the fact that your alkaline soil will give you pink blooms, but many people want hydrangeas for their bright blue color. The pH scale goes from 0-14, with 7 being neither acidic nor alkaline – it is neutral. 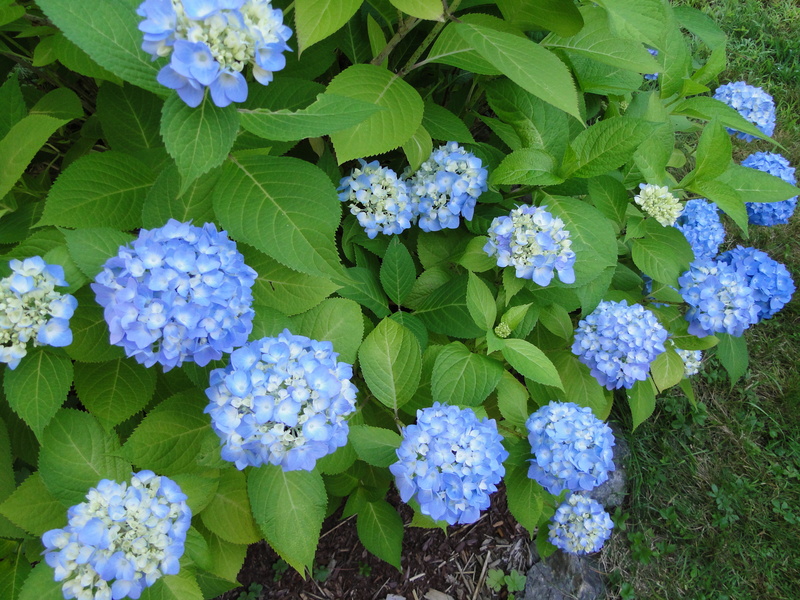 If your soil is naturally alkaline, or has a pH above 7, you can try adding an organic amendment to bring down the pH which may change your hydrangea flowers to blue. I live in an area that has acidic soil naturally. We can easily grow acid soil loving blueberries, rhododendrons, azaleas and other plants – including blue hydrangeas – without adding any amendments. I have never used any products to create an acidic soil, but I’ve read about it and this is what I’ve learned. If you buy a blue hydrangea and want it to grow blue flowers in your yard, check your soil’s pH – in the place you plan to plant them. Any soil that is high in lime can cause pink blooms, and that means plants near the cement walls of a house could be growing in a more alkaline soil. There are various ways to bring the pH down to the right levels. Making an acidic soil mix for a pot is relatively easy, but changing the pH out in an area of your yard is much more difficult, and it will need constant monitoring. It is not a permanent fix and could take weeks to achieve. In general, organic type matter will help lower a pH. When starting a garden add organic compost, composted manure, and / or pine needles which all help lower the pH. Also, you may want to buy a bag of garden sulfur and follow the directions for application on the bag. If your soil is naturally alkaline, you will be fighting the elements to get those blue flowers. It may work better to grow them in a pot, or learn to love hydrangeas that are pink.